Udo Heimer - Completely recreated in 1998/99 to celebrate it's 25th year in Nerja, Restaurante Udo Heimer now serves the most imaginative and eclectic selection of food, applauded for its integrity and variety. Fresh ingredients professionally prepared and cooked make this an absolute favourite! Interesting well executed menu. From excellent spit roasted lamb to large prawns wrapped in bacon with curried banana sauce and fruit rice - there is plenty of choice and a few pleasant surprises. This is a smart, even somewhat minimalist restaurant where seasonal flowers adorn the windows, making the detached purpose built resaurant stand out in its residential location. The elegance of its table settings and impeccably courteous service have made it a magnet for discerning diners. Restaurante '34' - In the heart of Nerja, just a few minutes stroll from the Balcon de Europa, this is a beautiful and sympathetically restored Andalucian house. The British owners have gathered together, over the years, a remarkable collection of fine art and antiques which furnish the sitting room and restaurant. The wood panelled dining room overlooks a beautiful garden with elevated views over the Mediterranean and along the coastline. 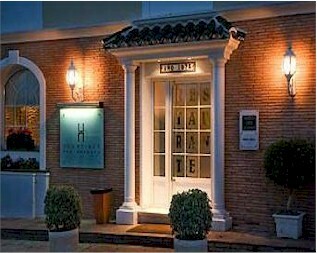 Fresh Mediterranean seafood, meats from the heartland of Spain and seasonal game are found on the concise menu with clear English translation. There is also a fine selection of digestifs, ports and fine Brandy. Service is friendly and informal and children are welcome. Everyday prices for a real evening out. Very popular with locals and visitors alike so it is essential to book.... 952 52 54 44. Pata Negra - Small very typically Spanish. Sound cooking of fresh food is the order of the day here. Share the platter of Serrano ham and Manchego cheese to start, or enjoy the specialty large prawns in puff pastry with leek sauce. Many local restauranteurs and business people eat here. Starts quite late. Friendly and English spoken. In the square (Plaza Marina), top of Ave. Castilla Perez. Chiringuito Ayo - Burriana beach restaurant with excellent broad ranging menu. Paella is the speciality cooked in enourmous pans on an open fire. 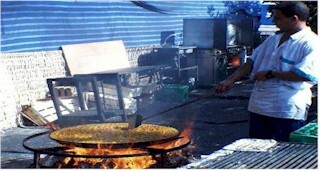 Ayo is acknowledged throughout Andalucia as the top Paella chef. Lunchtime only except in two evenings per week in the summer when there is a live Flamenco dance spectacular. This is THE meeting place for Sunday lunch especially as a roast leg of pork with sauteed vegetables is barbequed and will sustain you 'til Monday! This is the last but one restaurant on the Burriana Beach, on the left (looking at the sea) Prices are extremely reasonable. La Restinga - About 3 kilometres outside Nerja, to the west on the road to Malaga, this restaurant is situated right on the water's edge. 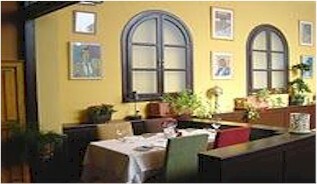 There is a delightful terrace overlooking the sea and the speciality here is fresh fish. The fish soup is particularily good and enormous - served in a large tureen it has the ingredients of an authentic French bouillabaisse. Easy parking. Haveli - If you like Indian food this is the only game in town! All the usuals - Tandoori, kormas and breads. Everything you would expect. Quite reliable. Open air terrace upstairs. Dragon Inn - Same observations as the Haveli - but this time it's a Chinese and although it's not the only one in town, it is voted the best. A little difficult to find, it is on the ground floor of a building in Calle Chaparil, opposite the junction with Calle Antonio Millon (near Bernadette's office) underneath 'Hostal Alhambra'. El Puente - Literally on the old river bridge close to the Supersol supermarket at the west of town. Popular pull-up for truckers, so basic but large portions of good honest wholesome Spanish food. On all but the hottest days, have the Spanish bean soup...WONDERFUL!! Stongly recommended. Also the menu del dia is fantastic value and highly recommended. There are many, many more restaurants, snackbars and other eateries for you to choose from and we invite you to tell us which were your favourites and why. The ratings are strictly personal taste and you may well rate them differently. English is spoken is most places and menus are usually in English, Spanish, German, some French and even some Russian. HAPPY EATING!